Congratulations! You are about to graduate from grilling dogs and burgers to the age-old art of smoking meat. Upgrading to a pellet smoker simplifies the art of smoking by taking 95% of the guesswork out of timing and monitoring temperatures. The best pellet grills are the perfect tool for an amateur chef new to smoking, and competition pitmasters alike, for incredibly accurate, replicable and consistent smoking of meats at home. May is National Barbecue Month in both the U.S and Canada, and it’s just around the corner (even if it’s January when you read this). It’s the best time of the year to enjoy outdoor fun, get together with friends, smoke some ribs, briskets, and chickens. With pellet grills, you can smoke and grill any time of the year. According to the Hearth, Patio and Barbecue Association, 75% of U.S. adults own a grill or smoker. Of these owners, 45% plan to purchase a new one in the next year. 37% of all U.S. adults plan to purchase a new grill or smoker next year. Chances are you or someone you know will be looking for a new smoker this year. We can shorten your time and help you make an informed decision by reading this roundup, to help you find the best pellet smoker for your needs. Note: Clicking the above links – except for the Yoder Model – will take you to further information, current prices and customer reviews on Amazon. Smoking meat requires constant monitoring of grill and meat temperatures, cooking and smoking times. There are a lot of variables, but pellet smokers take the guesswork out of the equation in two ways. First, they burn hardwood pellets instead of briquettes or wood chunks. Second, digital controls are the brains of the smoker. They can control the amount of smoke and heat at any given time by altering the flow of pellets. Pellets are inexpensive; they cost about the same as propane per cook. They are a renewable resource and produce much less ash than charcoal smokers. You can buy pellets in a variety of hardwood “flavors” and most cookers burn about 1.5 to 2.5 pounds of pellets per hour at 225°F or 107°C. WARNING- Never use wood pellets made for home heating. They can contain pine, which tastes bad, and pressure treated wood which is toxic! Use only pellets made for cooking. A hopper contains the wood pellets. The pellets drop into the auger tube which feeds them into a combustion chamber. The digital controller tells the auger how much to feed at a given time. More pellets mean higher heat and less smoke, while fewer pellets will produce lower heat and more smoke. The auger and tube should be large enough so that it won’t jam. There should be enough separation from the end of the auger tube and fire pot so that there is no chance of fire going back into the hopper. Will the hopper stay dry in the rain? The larger the hopper, the less you have to babysit. Hopper Cleanout. Is there a clean out door or do you have to scoop them out manually? There are two parts to the combustion system, the fire pot, and the igniter. The fire pot is nothing but a thick steel can with some holes punched in it for ventilation. The igniter rod works much like the cigarette lighter in a car. The tip glows red hot during the initial startup, and once the controller senses the heat in the grill, the igniter shuts off. Look for stainless steel or thick metal fire pots. Igniters can burn out over time so ask about how difficult it is to replace and availability. In general, the more stainless steel used in the construction, the less chance for corrosion, but the higher the cost. Most manufacturers build using steel that has been either painted or powder-coated, an enamel-like coating that is baked on. Look for internal parts like the grill grates and fire pot made with stainless steel for the longest life. Porcelain coated iron grates are the next best choice. Most modern pellet smokers come with programmable digital controllers. Some are Wi-Fi accessible and programmable with your phone. One newer innovation is the PID (proportional–integral–derivative) controller. It calculates the variables in the grill and keeps the temperature within 5 degrees of the set point. These controllers make cookers as close as you can get to smoking meat on auto-pilot. In addition to a probe for the smoker temperature, look for controllers with at least one meat probe to monitor the internal temperature of the meat for better results. Some models can have up to three separate meat probes. You will find guarantees from one to ten years from different manufacturers. Although the guarantee is not usually a deal breaker, it can give you an idea of what the manufacturer thinks about their product. You will see the guarantee in each one of our reviews. Here is our list of eight highly popular, recommended grills on the market. They’re of various sizes and meet our quality guidelines. Somewhere in this list, you are sure to find the right choice for your budget or requirements. The REC TEC RT-700 replaces what was once possibly the most recognizable pellet smokers from a distance, the bright red powder coated RT-680 with stainless steel bull’s horn shaped handles. This new model RT-700 smoker holds a generous 40 pounds of pellets, making it suitable for long cooks. The construction is sturdy, most of the internal parts are stainless steel including the cooking chamber, grill grates, towel ring, controller shelf, hopper lid and handles, lid piano hinge and a whole lot more. The RT-700 uses Smart Grill Technology™, a PID (proportional-integral-derivative controller) to keep the temperature steady. The grill has a working temperature of 200°F to 500°F (93°C to 260°C) programmable in 5°F degree increments for better cooking results. REC TEC includes an internal hood light wired into the system for better visibility. A nice feature is the control box on the left that doubles as a small shelf with tool hooks attached. The hopper lid on the rear works as a nice warming shelf. This model has 702 sq. in. of cooking space, one of the largest cooking areas of the grills we’ve looked at. You can cook 6 large racks of ribs, double if you have rack holders. Or, it can hold a brisket and two pork ribs at the same time. If that’s not enough, you can expand to 1045 sq. in. with the optional second shelf. Moving the grill is easy with the grab handle located under the chimney. Large 40 lb. hopper and grill size gives plenty of room to cook for a crowd. The internal parts and grill are stainless steel for long life. It looks striking on your patio. Internal hood light for 24-hour cooking. The 6-years warranty is one of the longest that you’ll find for any pellet grill/smoker. There is no pellet hopper release should you want to change to a different pellet. The fire pot doesn’t come out for cleaning, but you can always vacuum it out. REC TEC (BULL) RT-700 Wood Pellet Grill is user-friendly, good for beginners and competition level cooks alike. The stainless steel finish to many components and the shelves will make this the centerpiece of your deck or backyard. It’s great for parties, easy to move, produces excellent results and deserves top spot as our best pellet grill. Note: We take a more in depth look in our Rec Tec RT-700 pellet grill review article here. The two big differences between the Cook Shack PG500 and other smokers are construction and access. The PG500 is made in the U.S. using riveted, all-stainless steel construction, inside and out. And instead of a lid that opens vertically, this grill/smoker uses two doors, left and right. The cooking chamber is rectangular instead of rounded, providing a flat warming shelf on top. Zone one is a 10″ wide x 18″ deep direct cooking area directly above the fire pot and diffuser plate for grilling and searing. It does a nice job of searing and grilling steaks. Zone two is on the right of the firepot, an 18″ x 18″ indirect zone for high or low temperature roasting with or without smoke. Zones three and four refer to the upper 10″ x 28″ nickel plated steel rack. Zone three is above the firepot, making it much hotter than Zone four above the indirect cooking area. In all, the PG500 has 784 sq. in. of the cooking area which you can turn into 4 zones of cooking, direct, indirect, cold smoking and holding. It has the versatility of either grilling steaks or smoking cheese. It requires a 120 VAC power source with at least five amps for the 36,000 BTU burner. The digital controller has a range of 180°F – 600°F (82°C to 315°C). At 600°F (315°C), this is the hottest smoker we tested, although the direct cooking area is small. The 22-pound hopper capacity should give you about 33 hours of smoke time at 225°F (107°C). They’ve designed a convenient front access ash drawer for easy cleanup. The grease drips into a pail that hangs off the spout on the right side. It has two casters and two stationary legs for maximum stability. CookShack covers the grill with a 2-year limited warranty, but also give you a 30-day money back guarantee, which gives you a chance to try it. The PG500’s Digital Controller maintains a constant temperature of a few degrees from start to finish. All-stainless inside and out provides maximum durability. The 4-zone cooking gives you more cooking options with the same grill. Clean out is simple with two pull out drawers for grease and ash. Large 22 lb. hopper capacity for longer cook times. The direct fire zone gets hot enough to grill steaks perfectly. Because of the open design of the fire pot for the high heat zone, ash can blow onto the food from the fan forced convection air. The high heat area of Zone 1 is relatively small and holds only four striploin or 6-8 burgers. No meat probe option for the controller means you have to check the internal temperatures by opening the door, losing heat in the process. The PG 500 does a great job of smoking meat and holding temperature. It’s versatile enough to use as a grill if you only cook small amounts at a time. It’s durable and easy to clean. It also comes with a side prep shelf and a 40-pound bag of pellets to get you up and smoking right away. Cookshack, Inc. makes these pellet grills in the USA. It’s easy to spot the Traeger Pro Series 22 Bronze with its signature powder-coated bronze finish. It has a generous 572 sq. in. total cooking area. 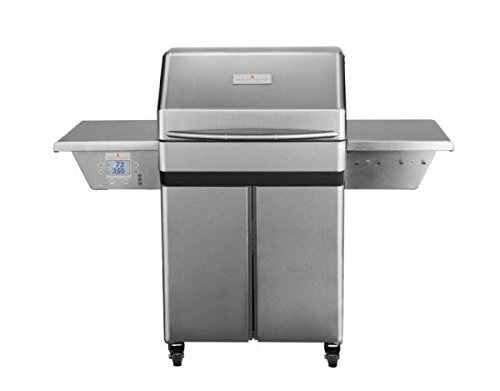 The main grilling area is 22″ x 19″, enough for 5 racks of ribs, or 4 chickens or 24 burgers. With the additional 22″ x 7″ rack, you can hold another 12 hot dogs. Traeger upgraded this model to include the Digital Pro Controller with Advanced Grilling Logic to keep internal temps within +/-15°F (+/- 8°C). It doesn’t have the biggest hopper at 18-pounds, but it does feature a back door clean out for easy pellet removal for a mid-smoke flavor change. Once the meat is on, and you dial in the desired temperature all you have to do is watch the clock. The Pro Series 22 eliminates burning, undercooking and cold spots. Moving the grill is easy with the sturdy side mounted lift bar and large locking plastic wheels that can roll over deep wet grass. The unit mounts on wide sawhorse legs for stability. This smoker weighs 110 pounds and measures 41″ x 22″ x 24″. This pellet grill has a 3-years warranty. Dual meat probes, included, reduce the frequency of opening the lid to check temperatures. The upper rack is also part of the package instead of an accessory. Pellet cleanout is a nice feature for when you want to change smoke flavors. 18-pound pellet hopper gives ample cooking time. Sawhorse legs keep this smoker stable and secure. Has trouble maintaining cooking temps in cold and windy conditions. Only gets to about 450°F, not high enough to grill steaks properly. You must vacuum out the ashes as there is no clean out door. The bronze cover of the Pro-Series 22 gives it a clean, classic look. It is medium size grill with enough cooking space to take care of a family of five. With the upper cooking rack, you can prepare your side dishes while the ribs and chicken smoke below. At 77 pounds this compact traeger pellet grill is perfect for small areas and small families. It’s only 38 inches wide and 22 inches deep. One interesting feature is that it has no open flame complying with most HOA rules. The 300-sq. in. (20″ x 15″) grilling area will hold up to four chickens or a 20-lb. beef brisket. The grill grates are porcelain coated steel for easy cleaning and rust protection. The grill frame and body feature powder-coated steel combining economy and durability. It has the “sawhorse” frame for stability and oversized plastic wheels make it easy to roll around. The temperature controller has an LED display and oven-type knob for settings. It is not as accurate as other models with 25°F increment settings and a +/- 15-degree fluctuation. The generous 10-pound pellet hopper provides about 8 to 16 hours of smoke time depending on cooking temperature. It comes with a 10-minute cooldown cycle where the fan also blows out excess ash from the fire pot. This grill is perfect for smaller households, tailgating or as a second grill for your vacation home. Compact size makes this a perfect smoker for small areas. This smoker complies with most HOA rules regarding open flames on balconies. Oversized plastic wheels make it easy to move. Porcelain coated steel grill grates for long life. 3-years warranty Overall, 1-year warranty on the grates. The controller is not as sensitive as it could be. There is no meat probe option. Pellet hopper requires a better design as pellets don’t all go in the auger without help. 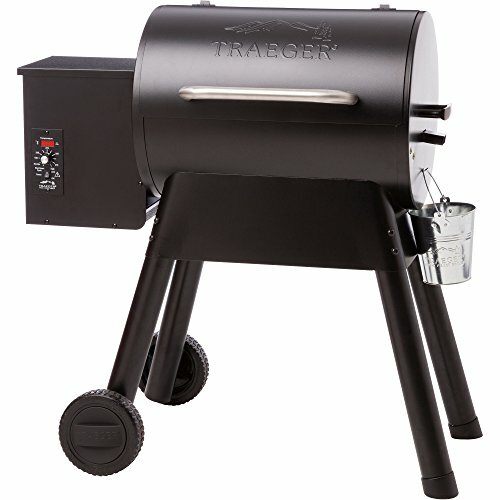 The Traeger Bronson 20 is a good choice for a second smoker or ideal for small balcony or patio. 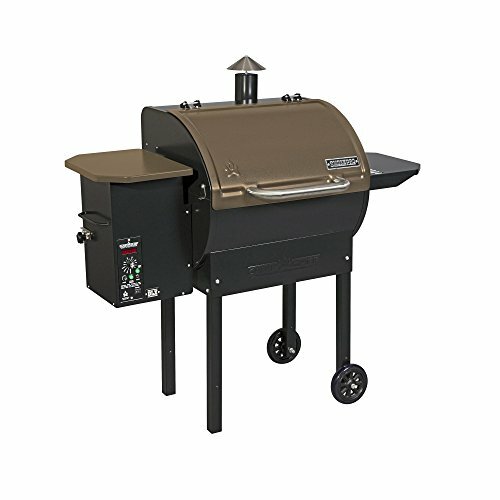 This smoker is economical and has all the basic features that larger or more expensive grills have. This grill runs off a standard 110-volt outlet. It uses about 300 watts to fire up the igniter for the first four minutes. Then it only requires about 50 watts of power after that. Drive other campers crazy with the smell of smoked meat. The Davy Crockett Pellet Grill combines portability with the convenience of a digital Wi-Fi controller. You can control and monitor your meat with the iOS or Android mobile application. Take it camping, set it up and go off and play. It uses a thermal probe, and the digital controls adjust in 5-degree increments. The “Sense-Mate” thermal sensor monitors the temperatures of the meat and the grill. It’s fully programmable from any Wi-Fi enabled device. The Davy Crockett has three power options for the ultimate in portability. It runs on the 12-volt cigarette lighter, a 110-volt converter or even the 12v jumper cables that come with the kit. At 69 pounds (and a little help) it fits in the trunk of a car. The fold down legs acts as handles. The lid is peaked instead of rounded, adding height for ribs or whole birds. It comes with an attachable tray with utensil hooks and a grease catching cup on the outside for easy cleaning. It comes with three power source options including your vehicle’s cigarette lighter making it portable. Wi-Fi enabled digital control means you can monitor and adjust the cooking progress from any device, anywhere. Large enough to hold both a brisket and a beef tenderloin at the same time. It has an open flame option and can go up to 500 degrees for searing. Only 69 pounds and the legs fold into handles for easy carrying. Because the unit is so compact, the pellets in the auger can pre-ignite. The hopper only holds 8 pounds of pellets. The left side tends to cook hotter due to the slanting grease plate below the grill. The Davy Crockett is the best choice for tailgate smoking. It’s compact, portable and runs off your car cigarette lighter. You can smoke a split chicken from start to finish in just 2 hours. Program and monitor the entire cooking progress on your phone if you are out and about. 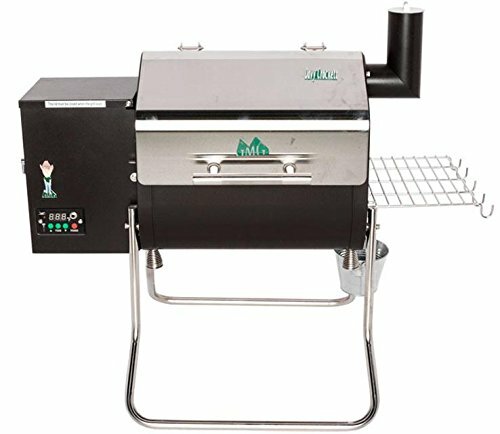 The Camp Chef DLX pellet grill and smoker comes with features you don’t find even on more expensive models. At 127 pounds, this is a very capable smoker with a generous 429 cubic inches of cooking space. Including the removable upper warming rack, you get 429 square inches of cooking area. It comes with a built-in meat probe that runs through a special port in the sidewall. It attaches to the smart digital temperature controller that provides cooking temperatures from 160°F up to 500°F (71°C to 260°C). You can set to low smoke or high smoke which is about 225°F (107°C). This smoker holds two large chickens or three racks of baby back ribs. With an optional pizza stone, you can even bake pizza. The back is square instead of round, so there is more room on the upper rack. Two of the nicest features on this smoker are the ash and pellet clean out doors. To clean the ash pan, there’s no vacuuming needed, you simply pull a lever and the ash empties out from the firebox into a cup mounted underneath the burn area. A trap door gives you quick clean out for the pellet hopper too. Leaving pellets in your hopper can cause them to become damp and hard to burn. Plus, there are times when you want to change wood pellets to enhance the smoke flavor. This smoker has an 18-lb. hopper with an easy release trap door so you can empty it fast. Also, the lid over the pellet hopper does not keep rain out, so you want to empty it and store your pellets in an airtight container. It has two plastic wheels on the right side while the left legs are stationary, making for a very stable platform. Camp Chef makes it easy to set up and get cooking with seven online training videos in their multimedia selection window. This smoker comes with one year warranty. Built-in meat probe and port make monitoring your meat easy. The hopper clean-out door, lets you change pellets fast or store them inside. Rear-mounted smoke stack leaves right side open as a prep area. Big enough for six beer can chickens. The lid is thin and does not seal tightly. On cold, windy days, it has trouble maintaining temperature without help from a wind break or insulation like a welding blanket. Pellet cover is not rainproof and can get your pellets wet if you don’t cover it. The controller is not programmable, so you will need to monitor more often. If you are looking for a hassle-free clean-up and a grill that will smoke two chickens and one brisket at the same time, this grill is for you. Most grills require you to disassemble and vacuum to clean the ash. But as we stated before, with the PG24 you simply pull a lever, and the ashes fall into a cup mounted on the bottom. This is a huge time saver, and will encourage you to use the smoker more – or at least, not discourage you through fear of the cleaning routine! Note: For an even closer look at this model, you can check out our full review of the Camp Chef SmokePro DLX pellet grill. If you are looking for the highest quality construction, materials, features and design, the Pro-28 inch by Memphis Grills is what you want. They built this smoker/grill out of 430 stainless steel, double walled where it counts. There is a 304-stainless steel upgrade available. All internal and extra parts are stainless, so you’ll never worry about corrosion. The lid has a commercial grade oven gasket for a tight seal. It weighs 213 pounds and has four locking casters for mobility and stability on hard surfaces, but don’t try and roll it over soft ground, because they are too small. The cooking area is 562 sq. in. or 834 sq. in. with the optional grates. This grill has one of the highest temperature ranges from 180°F to 650°F (82°C to 343°C). All internal parts are stainless steel for long life. You switch from direct to indirect heating using the “Genie Tool” they provide. This tool cleans the grill grates and grips the various parts of the grill for access and cleaning. You can program your cook from start to finish using the Intelligent Temperature Control (ITC) at the grill or from any Wi-Fi enabled device. This unit has two fans instead of one for better circulation and cooling down. The Pro-28 comes with one stainless steel meat probe, but the control has jacks for two more if you want to monitor different meat. This smoker comes with a rear mounted, dual hopper holding a total of 18 pounds of pellets. You can add two different pellets at the same time for different flavor profiles. Two nice features unique to the Pro-28 are the combination storage shelves left and right. The tops flip up to reveal stainless steel holding pans to hold all your secret ingredients. The Memphis Grills Pro-28 comes with a direct flame insert, Genie tool, one meat probe, and a free 20 lb bag of pellets. Manufactured in the U.S., this grill has a 7-year limited warranty. All stainless-steel construction makes it durable for a lifetime. 7-year limited warranty means the company stands by their product. 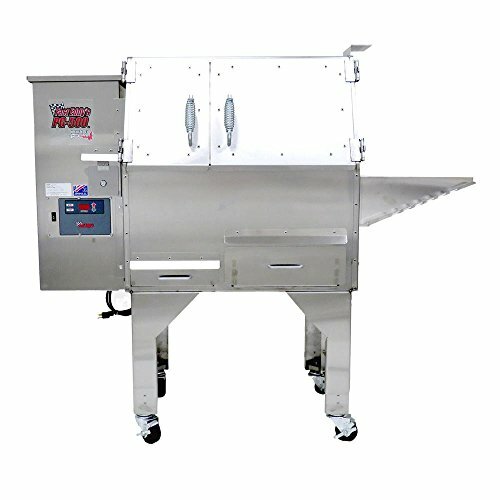 Dual hopper for mixing wood pellets. Two shelves with hidden storage is a feature no other smoker has. Wi-Fi enabled, so you can set it and forget it. Monitor the cooking from any device. The hopper does not have a cleanout making for a difficult pellet change. You must clean out the burn pot after each use, or it could make too large a fire the next round due to startup cycle misreading. You must purchase the Direct Flame Flavorizer separately to achieve higher temps for grilling steaks. If you are looking for a grill with low maintenance but high tech, this is the one. Double walled stainless steel construction will last a lifetime. This grill/smoker is on the higher end of cost but pays for itself over time. The convenience of Wi-Fi programming and ability to use three separate meat probes make this pellet smoker competition worthy, right in your backyard. The Yoder YS640 Pellet Grill is true “set & forget” smoking. Yoder opted out of using a common PID controller. Instead, they custom built the controller with software specifically for Yoder and the many variables of cooking and smoking meats. It has proven to be very accurate and reliable. Set from 150°F to 600°F (65°C to 315°C) in 5 deg. increments. It stays within a few degrees of your set point. With the optional “Direct Grilling Package,” the left side will climb to 700°F (371°C) for steakhouse style grilling. Another feature unique to this unit is the Variable Displacement Damper. It’s a metal plate you adjust from left to right along the smoke box to help concentrate or disperse the heat. The main cooking surface is 640 square inches with two 16”x20” grates. Adding the second 15.5″x28″ slide-out shelf provides a total cooking area of 1,070 sq. in., plenty of room for competition or feeding a hungry crowd. Featuring a 20-pound hopper, you get plenty of smoking time before you need to refill. It’s about 12” tall inside, plenty of room for a turkey or beer can chickens. The heavy-duty auger with high torque motor prevents jams. The offset burn pot allows for both direct and indirect heat and acts as an offset smoker. The YS640 weighs a substantial 335 lbs. and has a 10-gauge steel cooking chamber with 14-gauge steel for the hopper and cart. The finish is a high heat, satin-coated paint. It’s not powder coated. The reason, grills get scratched. It comes with the territory. So, Yoder’s decided to use paint because it is easier and cheaper to touch up when you need to. The heavy-duty construction using 10 and 14-gauge steel. Warranty is 1-year on the igniter, 3-years on the control system and 10-years on the cooking body is the longest in the industry. 20-pound hopper capacity for long cooking times. Chrome-plated ¼ inch steel bars for the cooking grates. The casters are too small to roll on anything besides concrete. Pellets can back burn into hopper if you don’t keep it clean. Yoder is a well-known brand in the competition and commercial barbecue world. The YS6740 is their attempt to capture the home market, and this smoker hits the mark. It has all the features the commercial models have plus the quality of materials and construction you expect from a commercial manufacturer. If you plan on cooking and smoking on a regular basis, then you should consider this as your first choice. Yoder believes in their product, so you get the best warranty of any pellet grill. Now that you have eight grills to look over, here are a few more things to think about before you choose the right smoker. Power – Think about how far your smoker will be from the nearest outlet because all pellet grills require 110v/120v AC power. Unless you plan on a permanent installation by an electrician, you want to buy a heavy-duty outdoor extension cord with a least 12-gauge wire. Maintenance – Anytime you mix steel, electronics, and weather, you can have problems. Motors, igniters, and electronics can and do wear out. Consider the age of the company and ask about the availability of replacement parts for the future. Some parts are common, and others are custom. Will you be able to get spare parts later? Your Cooking Style – Before you decide on a pellet smoker, think about how much you are actually going to use it. Are you opening a restaurant serving smoked meats or will just smoke an occasional brisket for you and the wife? Pellet grills are smokers first and a grill second. Typically, the burn pot is small and will not do as good a job of grilling large quantities of steaks and burgers as your standard charcoal grill. Most of them do well with one or two burgers if that is all you need. 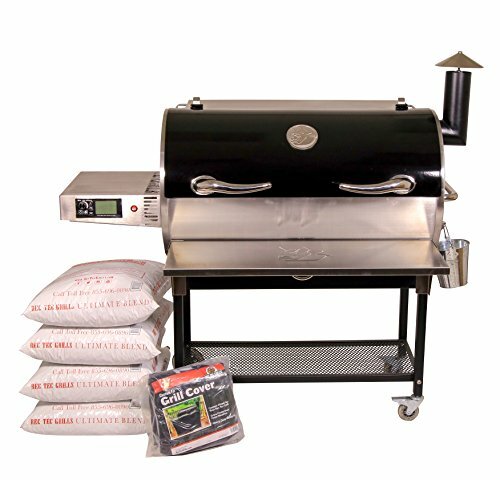 Pellet grills combine the experience of pit-masters with the technology of thermal probes and computer chips to make meat smoking easy for everyone. The “set it and forget it” technology makes these grills indispensable for anyone wanting quality smoked meats every single time. Grilling and smoking are two very different cooking techniques. While every smoker does a great job of smoking, only a few do a great job of reaching high enough temperatures for grilling too. That’s why we have chosen the Yoder YS640 Pellet Grill as our “Most Highly Recommended” model in our search for the best pellet smoker and grill. It has unparalleled performance and unmatched temperature control. It has a very large cooking area and the direct flame portion of the grill achieved high temperatures that would cook a steak properly. While not the best looking, it is easy to maintain with high heat spray paint should you need to touch it up. The heavy-duty steel will last for decades making this the only smoker/grill combination you will ever need. If you have any comments about the review or experience with any of the pellet grills here, please let us know in the comments below! Best Gas Grill Under $200 – Budget-Friendly, Awesome Results!